We have so many supplies that we use in art making that we really don't pay much attention to because they aren't the "star" of the show. However, if they weren't there, not in working order, or of very poor quality...it could impact the process or outcome of the work. I GIVE YOU THE HUMBLE SINK! 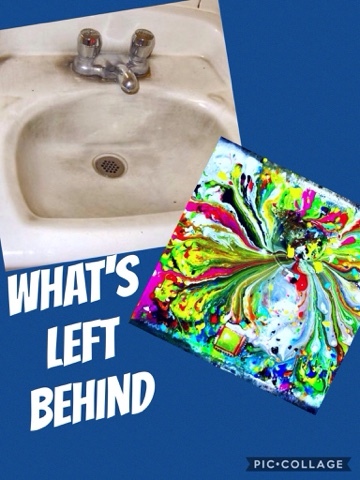 Yes, a sink is a key element in art making! As a painter, I'd be completely lost without a sink to obtain water for my water cup, for rinsing off my brushes when I'm through, or for helping clean up the mess when I've completed my work. I've seen sinks that looked like works of art after the artist finishes. I've seen sinks that look like they belong in a mechanic's shop & not an artist's studio. Sinks tell a story of who was just there & what they had been doing. This past week I'd been using clay with my students. After we were through cleaning up...the sink had a film of clay. You couldn't really tell at first when it was still wet, but the white "ish" film that appeared later when it dried..gave away that some type of work had been done in the art room. As a believer, what are you leaving behind? I'm not talking about tooting your own horn or receiving accolades for your accomplishments (for God). I'm talking about the personal impact that you have on people's lives in your family, with friends, co-workers, or strangers you encounter. In Philemon, we see Paul making mention of Philemon's love for God's people. Philemon's life was so impacted by his faith/walk with God that it left an impression on those around him. Now, it is possible non-believers might not have known what "it" was, but like the film left after clay day in the sink...there is no denying that something was at work that was positive & good. Those kind of interactions are teachable moments. I've had people ask me, "Why do you care? Why do you want to help me?" This is when I'm able to share why I do what I do...why I am the way I am...and who had left their mark on my life that made all the difference! What's left behind from your interactions with others? Are they encouraged, uplifted, informed, cared about, loved on...etc? Or is it like you weren't even there? Thank you for writing about our God in connection to teachin in the art room, it means a great big hopeful deal to me, thanks!